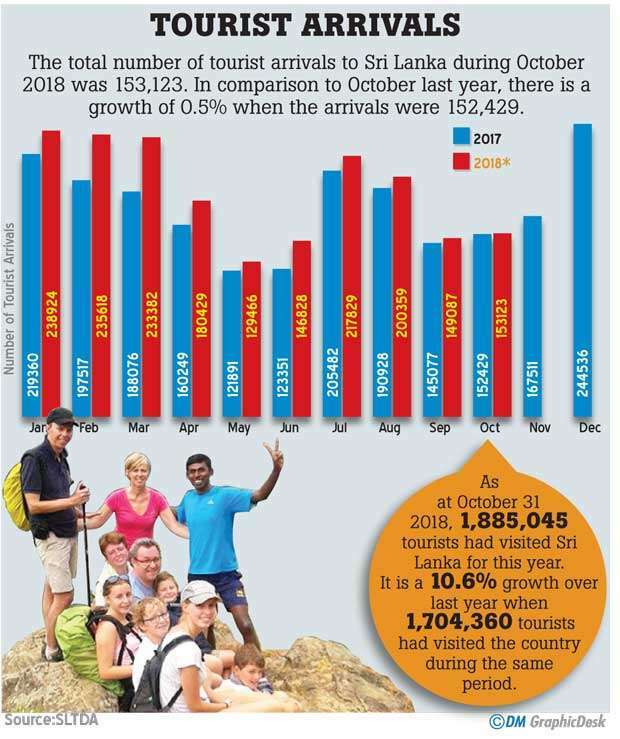 Tourist arrivals to Sri Lanka in the month of October increased only 0.5 percent year-on-year (YoY) to 153, 123 with arrivals from several key regions declining, data released by the Sri Lanka Tourism Development Authority showed. Asia and Pacific continued to be the largest source of tourist traffic to Sri Lanka with 47 percent of the total traffic received in October 2018. Europe accounted for 43 percent of the total traffic, America 6 percent, Middle East 3 percent and Africa 1 percent. India, China, United Kingdom, Germany and Australia were Sri Lanka’s top five international tourist generating markets in the month of October this year. India was the largest source of tourist traffic to Sri Lanka with 25 percent of the total traffic received in October 2018. China and the United Kingdom accounted for 12 percent of the total traffic, while Germany and Australia accounted for 7 percent and 5 percent respectively. Total arrivals from Asia & Pacific, led by South Asia, fell 5.3 percent YoY to 83,299, as arrivals from China fell 13.6 percent YoY to 18,882. Arrivals from Japan also fell 9 percent YoY to 2,831. Despite arrivals from India increasing by 3.2 percent YoY to 38,169, total arrivals from South Asian region fell 1.2 percent to 46,634. Tourist arrivals from Australia, which represents Oceania, rose 33 percent YoY to 6,847, and tourists from New Zealand also rose 23.8 percent YoY to 947. Arrivals from Europe during October rose 10.5 percent YoY to 59,583 and the United Kingdom accounted for 17,673 of that, up 41.2 percent YoY.Arrivals from Germany, the second largest source market for Sri Lanka in Europe however fell 2.6 percent to 9,920. Tourists from Central and Eastern Europe fell marginally by 1 percent YoY to 9,795 as tourists from Russian Federation fell 22 percent YoY to 3,096. Arrivals from the Middle East fell 15.2 percent YoY to 3,128 with declines from all Arab countries except for Jordan, from where a 2.3 percent YoY increase to 181 tourists was recorded. Arrivals from Americas led by United States (US) and Canada during October rose 2.8 percent YoY to 6,199. Tourists from the US rose 5.2 percent YoY to 3,714 while the number of Canadian tourists visited Sri Lanka during the same month remained flat at 2,406. The current political crisis brewing in Sri Lanka may affect tourist arrivals in November, although hoteliers had said that they were not experiencing any major cancellation. Up to now UK, US, Australia and Canada have issued travel advisories on Sri Lanka due to the current political situation prevailing in the country. However, despite the advisory, many British tourists are currently in Sri Lanka to watch the ongoing test cricket series between Sri Lanka and England. The cumulative tourist arrivals in the first 10 months of 2018 were little over 1.88 million, up 10.6 percent YoY. Although tourism authorities were originally targeting to attract 3 million tourists to this year, it is likely that Sri Lanka would end 2018 short of 2.5 million tourists. Tourist arrivals in 2017 hit an all-time high of 2.11 million, which represented a 3.2 percent growth YoY. Tourism revenues rose by a similar percentage to an all-time peak of US$3.63 billion. According to the provisional data released by the Central Bank, earnings from tourism during the first eight months of 2018 rose 12.5 percent YoY to US $ 2.93 billion. The government has set a US$ 4.5 billion earnings target for the industry this year.